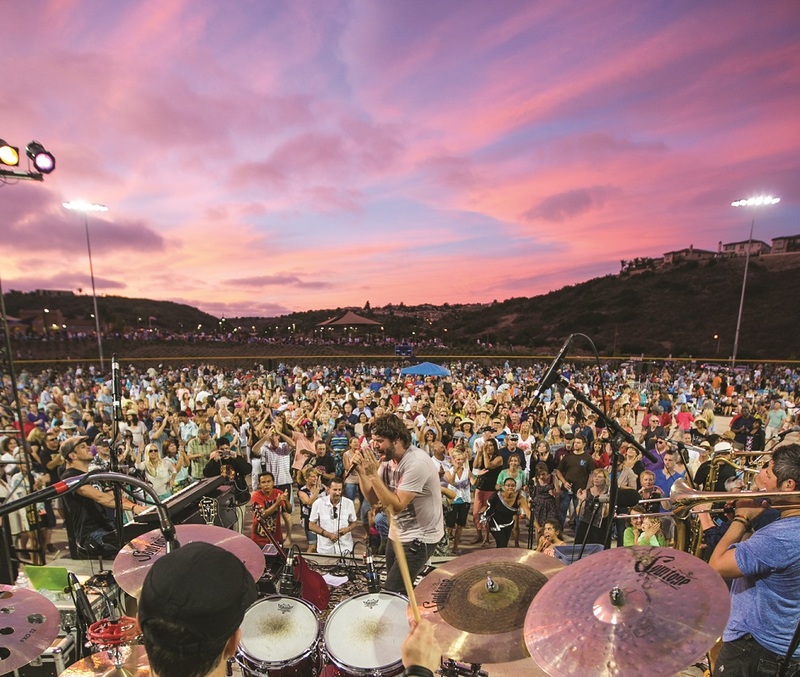 The City of Carlsbad’s popular TGIF Concerts in the Park will kick off June 26, 2015 at Stagecoach Community Park on Carlsbad’s eastern front with the rocking country sounds of the Kelly Rae Band and jam through with eight more concerts through August 21, 2015. “This year the City of Carlsbad is celebrating 30 years of great music, fun and community spirit with its TGIF concert series,” said Vincent Kitch, City of Carlsbad cultural arts manager. 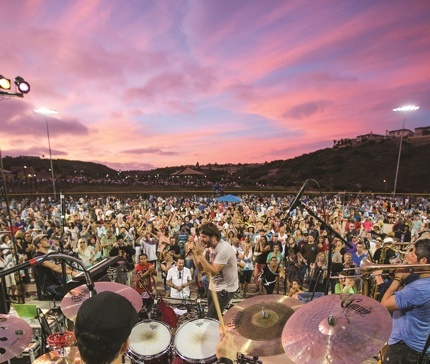 “Nothing says summer in Carlsbad like enjoying live music in the city’s beautiful parks.” . . Presented by the City of Carlsbad’s Cultural Arts Office, TGIF concerts feature a lively mix of regional bands and top touring groups. The music covers a wide range of styles, from big band swing to today’s dance hits. Family Open Studios at TGIF, a free, hands-on art activity for all ages, has been expanded this year and will be offered at every concert. The concerts will also feature food vendors providing hot dogs, hamburgers, pizza, frozen yogurt, barbecue and more. Free parking is available, with free shuttle service running for concerts held at Alga Norte, Poinsettia and Calavera Hills community parks. The City of Carlsbad begins its 30th season of TGIF Concerts in the Parks June 26 with the Kelly Rae Band, back by popular demand, at Stagecoach Community Park. The free outdoor concert series runs each Friday from 6 to 8 p.m. through Aug. 21 at Stagecoach, Alga Norte, Poinsettia and Calavera Hills community parks. Presented by the City of Carlsbad’s Cultural Arts Office, TGIF concerts feature a lively mix of regional bands and top touring groups. The music covers a wide range of styles, from big band swing to today’s dance hits. Family Open Studios at TGIF, a free, hands-on art activity for all ages, has been expanded this year and will be offered at every concert. The concerts will also feature food vendors providing hot dogs, hamburgers, pizza, frozen yogurt, barbecue and more. Free parking is available, with free shuttle service running for concerts held at Alga Norte, Poinsettia and Calavera Hills community parks. The complete concert schedule is listed below. Admission to all concerts is free. Additional parking available at La Costa Canyon High School (1 Maverick Way) and the Church of Latter Day Saints (3450 Camino de los Coches). Led by vocalist Kelly Rae performing songs by female country artists from Patsy Cline to Carrie Underwood, the six-piece group has opened for Melissa Etheridge and is the house band at Disney California Adventure. Audiences love to get up and dance to the modern soul songs of Quinn Deveaux, sung in his sweet tenor and carried by his band’s bright tones, evoking the music of Ray Charles, Fats Domino and Bo Diddley. Shuttle service operates from 4:30 to 9 p.m. at Ocean Collection and Arrowhead Insurance Group properties (2500 Campbell Place). The only tribute band endorsed by the official Johnny Cash Web page, Cash’d Out has over 150 of Cash’s songs in its repertoire and delivers hours of non-stop entertainment, including the June Carter Cash duets made popular again in the Oscar winning film, Walk the Line. The Detroit Underground features a solid and funky rhythm section and powerful lead vocalists that crank out tunes from artists such as Stevie Wonder, Chaka Kahn and Earth, Wind and Fire. Shuttle service operates from 4:30 to 9 p.m. from North Coast Calvary Chapel (1330 Poinsettia Lane). Ghanaian international music star Rocky Dawuni’s dance-inducing mix of reggae, soul and traditional African sounds is gaining popularity across the country. He’s worked alongside artists such as Peter Gabriel, Stevie Wonder and Jason Mraz. Tommy Castro is famed for his signature brand of rocking rhythm and blues, thrilling fans around the world with his live performances. He packs an even stronger punch with the addition of his new band The Painkillers. It’s a salsa party with Louie Cruz Beltran, who blends Afro-Cuban rhythms with jazz, Latin jazz, pop and R&B influences. He’s a charismatic entertainer, vocalist and master percussionist who has performed with legends such as Natalie Cole, Smokey Robinson and Poncho Sanchez. Shuttle service operates between 4:30 and 9 p.m. from Sage Creek High School (3900 Cannon Road). This San Diego based international act features Grammy winning musicians, a Billboard hit songwriter and a Chinese Idol finalist. This band performs the best in top pop dance hits and was a favorite with TGIF fans in 2014. The World Famous Glenn Miller Orchestra is one of the most popular and sought after big bands in the world for both concert and swing dance engagements. The orchestra plays more than 300 live performances around the world each year and is pleased to close out the TGIF 2015 concert series. More information on TGIF Concerts in the Parks, including details on what to bring and not to bring, can be found at www.carlsbadca.gov/arts. Since 1986, the City of Carlsbad’s Cultural Arts Office has worked to make arts and culture an integral and inspiring part of the community’s life, through programs and services such as TGIF Concerts in the Parks, Family Open Studios, Three-Part-Art, the William D. Cannon Art Gallery and City of Carlsbad Sculpture Garden, Carlsbad Community Arts Grants and other activities. The Cultural Arts Office seeks to create connections among artists, cultural organizations, community groups, businesses, visitors and residents that sustain and promote a thriving, diverse and creative city.